Quivala - Time Flies When You’re Having Fun! 185 attempts on the love dungeons. Alchemy cooldowns for 6 days. Said a few prayers for the angels to take some of the hard times away. My first Shadow Priest, Void Elf Shadow Priest, because what other race / spec would a Void Elf be? Included are my audio and this week's blast from the past. This week we are listening to episode 328 which has what I thought was a nice discussion of the Blizz store in addition to a few odds and ends. I hope you enjoy! 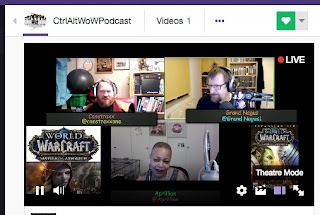 Ctrl Alt WoW Episode 556 - Where is my Love Rocket ? 15 mount runs a Day for the Big Love Rocket. 20 World Quests a for the Weekly 5000 order hall Resources. Playing 5 or 6 hours a day, I run out of time before I run out of stuff to do. I'm giving some love to my alts, upgrading Heirloom Gear on Plate classes, neck pieces, and trying to figure out how to min/max the game time i have every single day. 6 month recurring subscription coming up. In 3 weeks. Should spare account be Deluxe Edition as well? or is the basic edition all i Need? I know it will be half price at some point. Leveling Elemental Shaman (84) and Arcane Mage (73), ridiculous Queue times, 40-45 minutes for Cataclysm dungeons & same for Outland dungeons on DPS spec, very few healers. Some of the dungeons are clearly being run by people who have been away from the game for a long time, or by new players who dont run chat at all. Occasional wipes happy, people dont clear the patrols all around the bosses, they stand in the bad on the floor, they dont avoid AoE, all these things are normal with new players, if you have time and you are patient you can really make someone's day by patiently marking targets and explaining mechanics before the pull. If you are a tank and dont know the way, just ask the top DPS to assist in picking the route to go in the dungeon and how big the pulls should be. Playing Hearthstone Everyday for the chance at 3000 packs, the Year of the Mammoth is nearly over, so some of the cards are eventually going to move into the Wild category and wont be playable in Standard mode. Other Cards are already being modified on either cost or how much life they have, there is some clear cut balancing happinening for the last few sets of Cards, some new bundles are out if you want to check out the store, you can get 30 packs for a reduced price. There is an average of 1 legendary per 10 card packs. You get minimum 1 rare or better per card pack. Adami, Nightborne Priest completed On’goro as the 4th zone at 57 +´66%. Level 66 now and questing in Zul’Drak, the last zone i need for the Loremaster of Northrend. It only took eight years, but it did finally drop! The Big Love Rocket is mine at last. I was prepared to run the dungeon on all 47 characters for the duration of the event, but it droped on the second day. Now I have all the time I would have spent on the dungeons for leveling the new Allied Races. I finally got exalted with Argussian Reach, so I have been able to do the opening scenarios for all four of the races currently available. I have only started two of the races so far, the light forged Dranei and the Void Elves. Even if they are both Alliance races. I have to do the unthinkable and delete characters so that I have enough slots to create the next two Horde races. I keep deciding on one to delete, and then I just can't. In the end, I have decided to leave the Scarlet Crusade realm. I have a bank guild free to a good home, Alliance side on Scarlet Crusade. Just let me, and it is yours. My battle.net id is Duvessa#1925. And for the love of god, if you want a Toxic Wastling, please let me know. I swear they are breeding like Tribbles in my bank. Here are my audios for the week. I have part 2 of clips from episode 327 for my Blast from the Past. Hope to catch you all on Twitch this week!